All Ladies are invited to join us this summer for a Tuesday morning bible study. 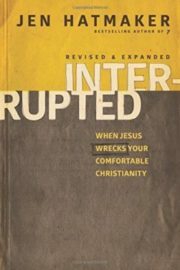 We will be reading/processing together Jen Hatmaker’s book Interrupted – When Jesus Wrecks your Comfortable Christianity. There will be childcare available each week ($50 per family). The Children’s Ministry will offer a Terrific Tuesday event each month for the kiddos during this same time!